At the 2015 Annual Starnet Worldwide Flooring Spring Meeting, the anxiously awaited design award winners were announced. Interior Surface Enterprises, LLC. 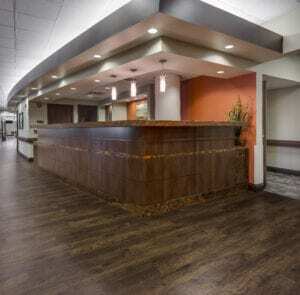 (ISE) was selected for the Gold Prize in the Healthcare category for our 39 & Rainbow flooring project. Landlocked with no space to grow outward, The University of Kansas needed to develop a multi-level care facility to meet the needs of their patients. This building had to be conveniently located within walking distance from the hospital campus. To capture the local urban feel, a four story Parisian-inspired medical facility was created. Owned by several groups within KU, designers were challenged to create a cohesive building meeting multiple needs. Using a mixed-use concept, the bottom level incorporates restaurants and retail shops. The top three levels house Transitional Care and Impatient Acute Rehab. Carpeting was selected to provide a hospitable feel with large scale patterns. LVT was selected for low maintenance, durability, and provided a nature inspired feeling. This relaxing, stress-free environment included a beauty parlor, a library, rehabilitation centers, and lounges. Bold designs were chosen to make the areas feel family-friendly. In clinical spaces, sheet vinyl was used. To create depth to the sheet vinyl, “area rug” accents utilizing accenting colors were inlaid in the patient rooms. For patient therapy sessions, ten foot vinyl intervals were installed in the corridors. Bringing community together, this eclectic building has created a new place for students, staff, and patients to enjoy.